BIE #AP 1st year, 2nd Year #Inter #Results 2019, AP Inter 1st yeaer results, AP Inter 2nd year results, AP Inter results and check AP Inter Results at bieap.gov.in: BIEAP Inter Results 2019, Inter #First (1st) Year March 2019 Results, Inter #Second(2nd) Year March 2019 Results, BIE Andhra Pradesh Inter First Year and Second Year March 2019 Results, Board of Intermediate First Year and Second Year March 2019 Results. AP Board Inter results 2019 likely to be declared on April 12. AP Board Inter results: The results of Andhra Pradesh (AP) Board intermediate exams are expected to be released on April 12, as per sources. In class 12, a total of 437,572 students had appeared for the exams. All those students who had appeared for the same can check their respective results at bieap.gov.in, once released. The exams for the first year began from February 27 and the second year exams started from February 28. The practical exams for general intermediate courses ended on February 21. The Board of Intermediate Education, Andhra Pradesh sate announced the the Intermediate Public theory Examinations Time Table for the Year 2019 in the month of December. The Students of the entire state followed the same methodology. Inter First year exams and second year exams were held from February 27 to March 18, 2019. All examinations held from 9 am to 12 Noon. all these examinations were conducted successfully by the Board of Intermediate Education, AP state. The Board of Intermediate Education Andhra Pradesh BIEAP on Friday announced Andhra Pradesh Intermediate first year result 2019 at 12:47 pm. Andhra Pradesh Educational State Minister Ganta Srinivasa Rao and Intermediate Board Secretary B Udayalakshmi announced the results in a press conference at YVS Murthy Auditorium in Andhra University, Visakhapatnam. The results are available on the official website bieap.gov.in. The AP Inter 1st year exams took place from 27 February to 18 March this year with around 478,621 candidates appearing for the exam. check the AP Inter 1st year exam results, students can also visit results.nic.in, examresults.net. The pass percentage for girls is 67 percent and pass percentage for boys is 57 percent with the overall pass percentage being 62 percent. Accordingly, AP MHRD Minister, AP Inter first year results will be declared on April 12th, 2019 and Second year results also on 12th April. Evaluation process would be completed in April 6th, 2019. The spot evaluation of Intermediate examinations would be completed in April month and the 1st year results are expected to be declared on 12th April, 2019, 2nd year inter results will be released on April 12th, 2019. These results will be released by the BIE officials and results will be uploaded on its official website. 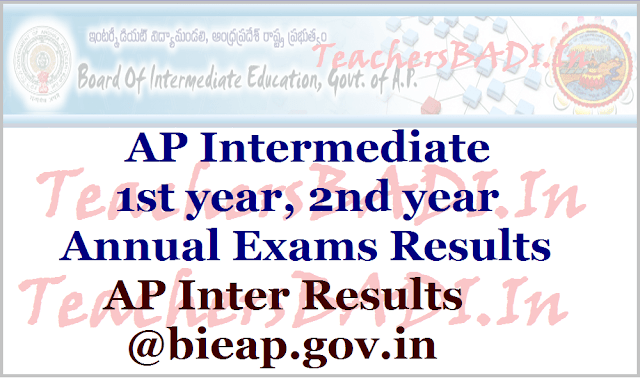 The Board of Intermediate Education (BIE) of Andhra Pradesh will announce the results of AP Inter First (1st) Year 2019 on 12th April at 5 pm while the AP Intermediate 2nd year results 2019 will be declared on 12th April. Students can check out their results by clicking given the following links. The students who were attend their inter exams, they are anticipating for their resu lts. Students can check their ts inter results at bieap.gov.in or http://examresults.ap.nic.in/. The first and second year Intermediate Public Examinations results will be declared on April 12. Both general and vocational courses results will be declared on Thursday at 12 pm. As per reports, the Human Resource Development Minister Ganta Srinivasa Rao will release the results . The intermediate board examinations in Andhra Pradesh began on February 27, 2019 with the Second Language paper for the intermediate first year students. The students can download their result on the Andhra Pradesh’s Board of Intermediate Education website (bieap.gov.in). Besides the official website, the candidates can check their scores on the following websites - examresults.ap.nic.in; results.cgg.gov.in. AP Board inter results 2019, steps to check: Step 1: Log on to the official website mentioned above, Step 2: Click on the link for results, Step 3: In the provided fields enter the required details, Step 4: Click on submit, Step 5: Your result will be displayed on the screen, Step 6: Download the same and take a printout for future reference. Results will also be available at examresults.net. How is the grading done? : Those scoring 91 to 100 marks will be graded as A1; 81-90 A2; 71-80 B1; 61-70 B2; 51-60 C1; 41-50 C2; and anything below that would be graded as ‘D’.